This is one of the most exciting books to come along in years — Glimpses of Eternity may represent an even greater breakthrough in the study of consciousness than did the author’s first work, Life After Life, and may offer great spiritual hope and inspiration to many. While Moody’s past books have explored aspects of the “near death experience”, Glimpses of Eternity explores a different phenomenon — that of the “shared death experience.” These are cases where a spouse, relative or caretaker, sometimes entire families, appear to accompany their dying loved one through their death and on to an afterlife, or different state of consciousness. The shared experience contains some of the same elements as a near death experience, but there are some differences as well. The stories in this book are amazing in their number and detail, and in the uniformity or common elements that seem to cross cultures and religions. But the real excitement may be that these reports cannot be dismissed in the way that the earlier near death experience reports were, that is, as a physiological response to almost dying. As the author writes, “Many people believe…that a near death experience is nothing but hallucination caused by a lack of oxygen to the brain, or fear, or too much anesthetic or not enough anesthetic.” Moody calls this view the “escape clause of belief” for those who don’t want to believe in the possibility of an afterlife. The shared death experiences related in Glimpses of Eternity come from healthy people who were not dying, and as such may force a new rational discussion of the possibility of an afterlife. Moody writes that he has been aware of such cases since the 1970’s, but that it took years of documenting anecdotal reports and much dedicated effort to begin to study what it all meant. Interestingly enough, the author had his own shared death experience when his mother passed away, and years of exploring these phenomenon became manifest. His story, along with many in this book, offer real insight into the transformative power of these events. There is sense throughout this book of some greater timing being at work — perhaps that we, as a society, weren’t ready for these stories until recently. Certainly, these cases build upon the knowledge and power of those depicted in the near death experiences. Glimpses of Eternity pushes everything we think we knew — about consciousness, spirituality and the metaphysical — even further. 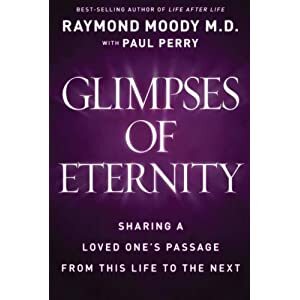 Glimpses of Eternity Sharing a Loved One’s Passage From This Life To The Next, published by Guideposts. Bio Continued: Dr. Moody received his MD from the Medical College of Georgia. He also received his Ph.D., MA and BA with Honors in Philosophy from the University of Virginia. Dr. Moody trains hospice workers, clergy, psychologists, and other medical professionals in all aspects of his work. In his private practice, he has also helped thousands of people who are coping with dying and the deaths of their loved ones. Dr. Moody is a regular public speaker and noted authority – he has appeared 3 times on Oprah, as well as on hundreds of other local and nationally syndicated programs.